Sometimes it is hard to find a name for a project. This one is a comission piece i call "Sir Victor Jazz", that will be the name of the guy his dog's name will be still searched for. So... oh dear, what an introduction, haha. Victor is from Smartmax's Smog Miniatures Series and his former Name is Major Dreadful with Winston. 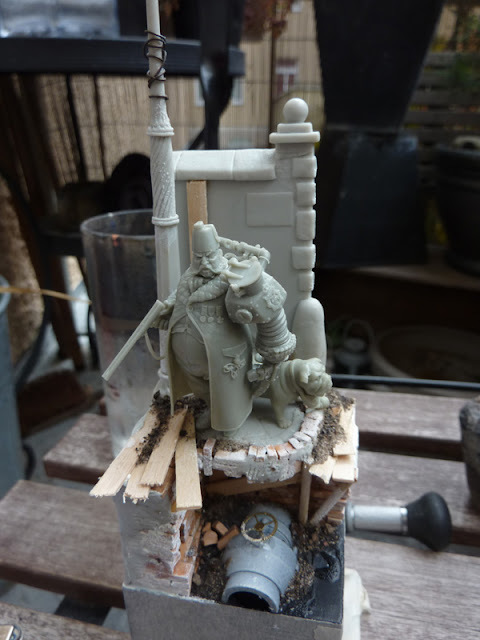 Love the style of the miniature and look forward to do Sir Victor Jazz justice and try to find my vision on this great sculpt. 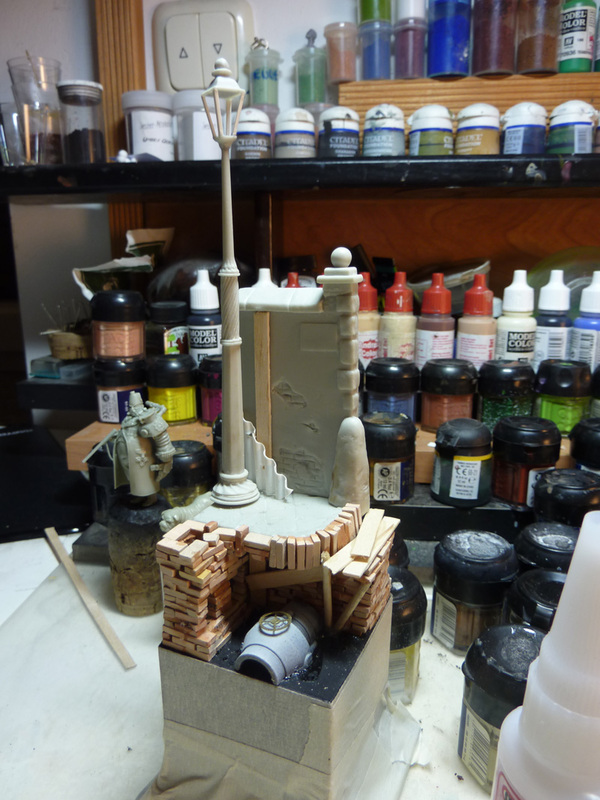 The scale is around a really small 54 mm model. 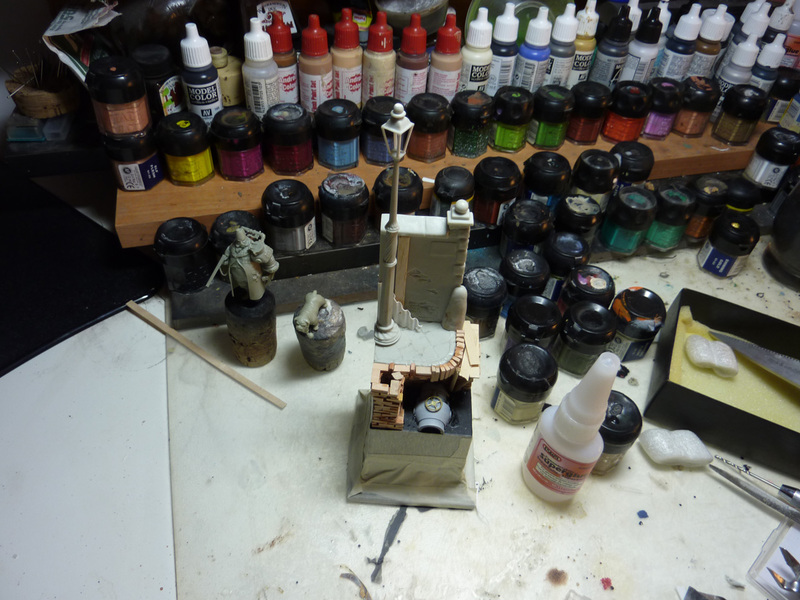 The right Ambiente for a SmartMax Miniature. I'm curious how it will looks when its ready. 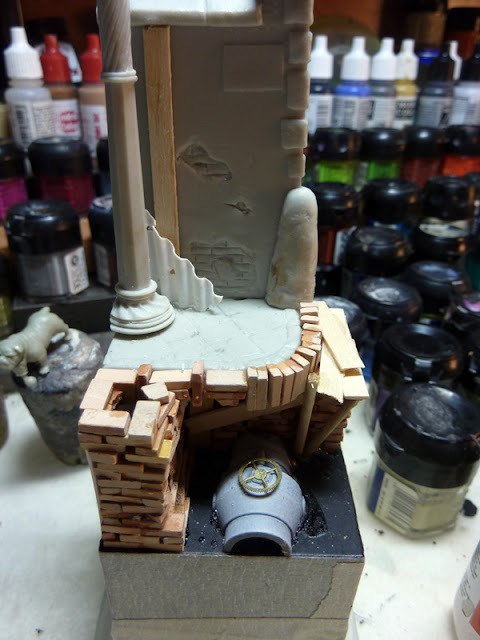 You applied the white primer on mini and surrounding separately ! So what is with the shadow that "Sir Victor Jazz" is casting on the Street ? "SmartMax Miniature" are very nice but also very expencive. What about Janis for the doggie? 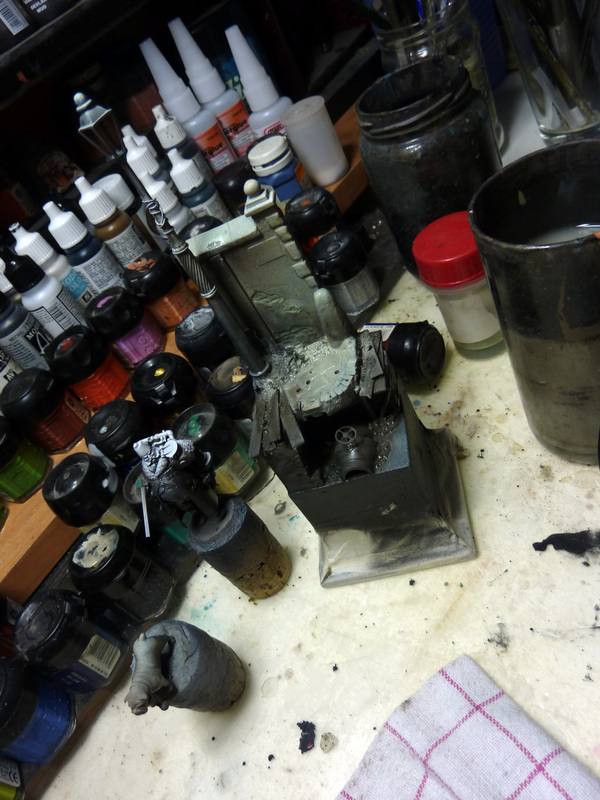 I have the very same miniature sitting in my desk since it arrived broken in pieces. The resin is too fragile. Where did you get the gaslamp bytheway? It's awesome! the miniature and especially the whole scene you created is really awesome! I`m not sure. 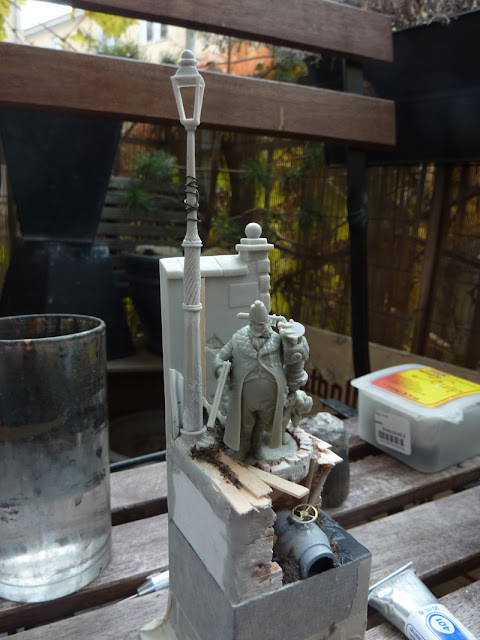 Isn`t the gaslamp a little bit oversized? Yep i did so... mmh, why? 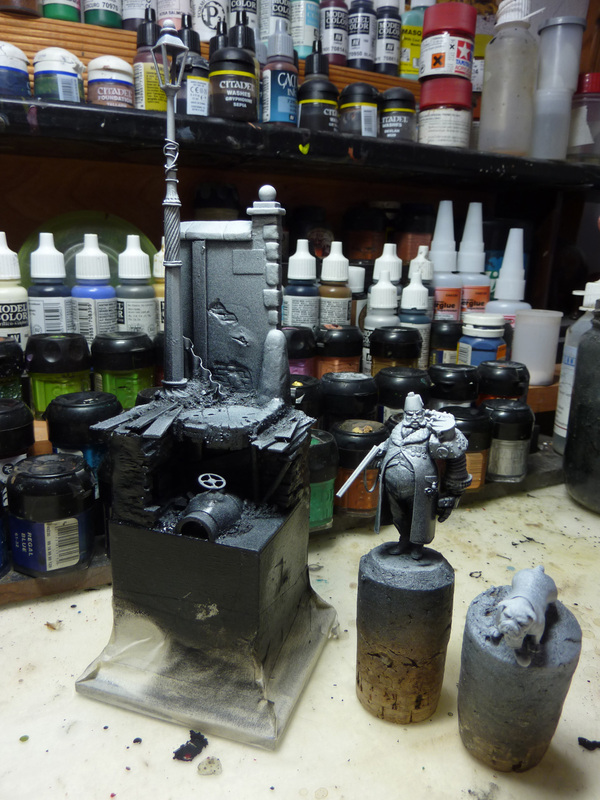 Is there a shadow of the miniature on the wall when i am painting a zenithal light? I found this blog a few months ago, and I must say, your work really rocks ! I wondered though, what are the bricks on this base made of ? No, not the Wall but the Street, wouldn't it be mutch darker ?! Shadow of the belly z.B.